Defendants said document would show Travolta "killed his son or was negligent"
NASSAU, Bahamas (CNN) -- A lawyer for John Travolta on Thursday told jurors that he refused to comply with would-be extortionists who allegedly threatened to go to the media with reports implying that the famed actor was culpable in his son's death. 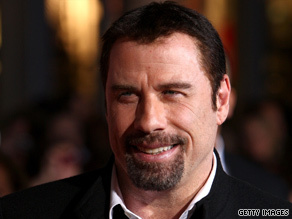 John Travolta's son died of a seizure in January at the age of 16. Attorney Michael McDermott testified in a case against paramedic Tarino Lightbourne and former Bahamian Sen. Pleasant Bridgewater. The defendants are on trial on charges they plotted to extort $25 million from Travolta after 16-year-old Jett Travolta died from a seizure in the Bahamas. Both have pleaded not guilty. McDermott was questioned Thursday about a January 12 telephone conversation with Bridgewater over a document Travolta signed that apparently released the ambulance company from responsibility because the actor wanted his son transported to the United States instead of the local hospital. The attorney testified that Bridgewater had told him the "document would show [Travolta] killed his son or was negligent in the death of his son." Also, McDermott told the court that Bridgewater claimed the form was evidence that Travolta was "trying to flee the country with his dead son." "I said to Mrs. Bridgewater, 'What you are doing is a criminal offense -- it's extortion in the United States," McDermott testified. No money was discussed, said McDermott, but Bridgewater believed her client, Lightbourne, thought it was valuable to the media. Bridgewater said, "My client put it this way, the document could be Mr. Travolta's or it could be the world's," McDermott testified. McDermott testified that he learned from a fellow Travolta lawyer that Bridgewater's client wanted $25 million to not release the document. McDermott said he contacted authorities and later met with Bridgewater in a Nassau hotel room for a conversation secretly recorded by Bahamian police. The price for keeping the document under wraps was dropped through subsequent phone conversations from $25 million to $10 million, to which Bridgewater's client agreed, McDermott testified. In testimony last week, Travolta said Jett was found unresponsive January 2 by a nanny at the home on the island of Grand Bahamas, where the family was spending their New Year's holiday. Travolta said he initially told the ambulance driver to rush them to an airport where his private jet was parked. Travolta, who is a pilot, said he wanted to fly his son to a West Palm Beach, Florida, hospital instead of driving him to one in Freeport. The paramedic, however, asked Travolta to sign a statement releasing the ambulance company from liability. "I received a liability of release document. I signed it. I did not read it. Time was of the essence," Travolta testified last week. Travolta said that while he and his wife were riding in the ambulance with their son, they decided to divert to the hospital. At the hospital, Travolta was told his son "wasn't alive," he said. On Wednesday, Travolta testified that he learned of a demand for $25 million or "stories connected to that document would be sold to the press." "The stories would imply the death of my son was intentional and I was culpable somehow," said Travolta. An attorney representing Bridgewater and Lightbourne asked Travolta if the defendants ever contacted or threatened him directly. Travolta said they did not, that he heard specifics about the situation through his attorneys. Court will resume on Friday, when the jury may view the surveillance tapes. Travolta and his wife are not expected back in court.